Video clip synopsis – John Glover revolutionised his art to become one of Australia’s finest landscape artists. Broadband MP4 landscapefigure_bb.mp4 (19.1MB), suitable for iPods and computer downloads. From the series Hidden Treasures – Inside the National Library of Australia. The National Library of Australia is the country’s largest reference library with over nine million items in its collection, including a surprising number of art works. In a new series of Hidden Treasures, Betty Churcher presents an insider’s guide to some of the little known and rarely displayed art treasures held by the National Library. From her unique vantage point, Churcher makes intriguing historical connections between paintings and engravings, photography, manuscripts and artifacts, illustrated journals and diaries. These are fascinating tales about the creative process and the works themselves that offer a tantalising insight into Australia’s culture and heritage. 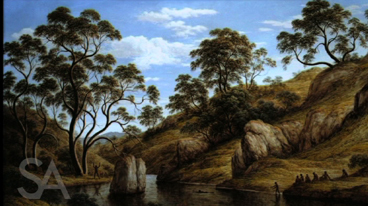 John Glover revolutionised his art and became one of Australia’s finest landscape artists after arriving in Tasmania at the age of 64 in 1831. A good English landscape painter, Glover became an outstanding Australian landscape painter when he turned his eye to an unfamiliar environment to produce the best works of his career. Glover’s private sketchbooks show he was appalled by the atrocities he saw committed against the Aboriginal people and was eager to portray them in the idyllic world he imagined they had once enjoyed. What he saw transformed him from a purely landscape painter into a figure in the landscape—a considerable departure for a man in late career. Glover’s work is described as being ‘picturesque’ in style. Explain what that means. Look at the works shown in the video clip. Describe the behaviour of the people in the paintings. How do the people fit into the landscape? Glover arrived in Tasmania in 1831. The scenes of Aboriginal life he depicted no longer existed in reality—Aboriginal traditional culture had been destroyed by this stage. What do you think might be the main message of the paintings to a person at the time? Do these paintings give us different messages today? Discuss the reasons for your answer.